Join us for the 3nd Charlotte French Festival, and celebrate the rich and entertaining French culture. Get ready to enjoy great food, wine, beer, crepes, delicious pastries, music, dance and, of course, the pétanque initiation and tournament. Fun and excitement for the entire family, while you learn more about the French culture. Leash up your dog-and-people-friendly canine family members and be part of the festivities, as we will have a canine costume contest with great prizes. This community event receives the support of Bienvenue Charlotte, the French Government through the French Ministry for Europe and Foreign Affairs and the Consulate General of France in Atlanta, the French-American Chamber of Commerce of the Carolinas, and the Carolina Petanque Club. 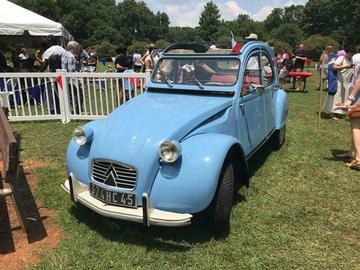 For complete details on the performers, food, crafts, shopping, and activities, visit www.CharlotteFrenchFestival.com or follow us on Facebook. Bring your own lawn chair, blanket, umbrella, sunglasses ;-) Rain or Shine.